Age: 17 years, 2 months, 5 days old. I can’t believe that the day before Thanksgiving we have to write some asinine English in-class essay about what we should be grateful for. Could this be any more eighth grade? b: am totally regretting that I didn’t just call in sick today (like I should have) I am opting not to do this at all. Right now I could be eating the last pack of Twinkies, catching up on Season 2 of American Horror Story, and texting Joshua. Oh well. Instead I’m going to make a Bucket List, aka all the things I’m gonna do before I kick it, although by the time I get old, science will have probably found a way for super-rich people to stay alive forever. Also, considering I have limitless access to anything, I will probably take care of most of this list by the time I’m 21 lol. 10. go on tour with Gaga as her personal dresser, give interviews, take credit. 9. buy a Gray Lurie parrot, name him Parrott, and teach him to say dirty words. 8. rent a killer house in Rio for the 2016 Olympics, invite everyone. 7. commission a temporary full body tattoo made of Swarovski crystals. 5. eat a deadly torafugu in Japan. Adele Griffin the critically acclaimed author of numerous novels for young adults, including the Vampire Island and Witch Twins series. Her novels Sons of Liberty and Where I Want to Be were both National Book Award Finalists. 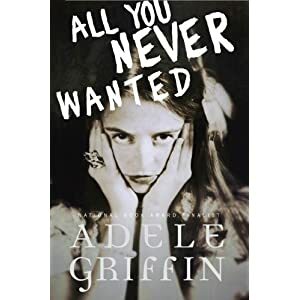 All You Never Wanted, Griffin's newest novel, was published October 2012. She lives with her husband and two children in Brooklyn, New York. Her website is www.adelegriffin.com. Follow her on Twitter @adelegriffin and Facebook. Author Question: What is your favorite thing about All You Never Wanted? 4. it's got a pretty hot romance, which is new for me, and was so thrilling and fun to write. 1. I dedicated the book to my mother. To win an ARC of ALL YOU NEVER WANTED, please complete the form below by 6:00 PM November 28, 2012. The winner will be announced on November 29th. Happy Thanksgiving! Thanks for sharing another great giveaway! Happy Thanksgiving. Nice of you to run this giveaway. Wondeгful gooԁs from you, man. I've understand your stuff previous to and you are simply too great. I really like what you have got right here, certainly like what you're stating and the way during which you аssert it. to read much more fгom you. That is really a tremendous webѕitе.